This striking cover with its skeletal visage—is it formed by smoke or fire?—wearing a top hat and the vintage map of London behind it have me asking: what is it that we have here? 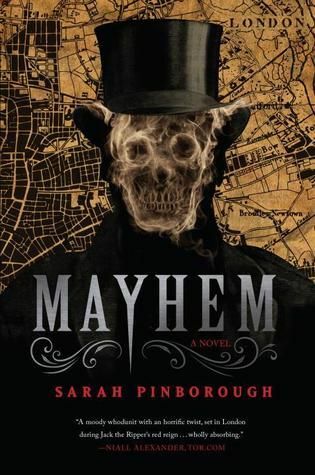 “A moody whodunit with a horrific twist, set in London during Jack the Ripper’s red reign…” says the quote (attributed to Niall Alexander) on the cover. I seldom pay attention to quotes, but this one actually gives me an idea of the story. I’d noted the period look of the cover image and the skull fits in with the Jack the Ripper theme. The appeal of this book, cover and all, puts it firmly in my to-be-read pile. Though I just might wait until Halloween to enjoy it.